August 28, 2018 Fortnite’s mysterious cube is getting even stranger. The Fortnite cube continues to allure and confound us in equal measure. After its most recent move, the cube has begun to glow pink around the base, and it’s now emitting a big dome of low gravity affecting everyone who steps within range. This could be the cube’s final resting place, or it could simply be a temporary stop on the great box’s journey. (Hail cube. It brings wisdom and mad ups to us all.) 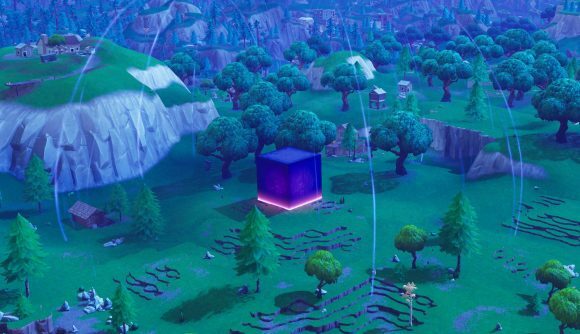 Cube made its debut after a series of purple lightning strikes destroyed the cactus ring out in Paradise Palms. It’s been bewildering us ever since. If you’ve missed everything up to this point, the cube is bouncy, knocking away bullets and melee-swinging players alike. It shows brief flashes of strange runes when it’s attacked. Bouncing on top of it restores your shields. Sometimes attacks result in players getting bounced away for a decent chunk of damage. It came down on Friday, arriving with a massive rift lightning strike, just like those that destroyed the cactus ring, except much bigger. Afterward, the rift itself finally closed off, apparently done with its interdimensional business for the time being. Since then, it’s been slowly rolling on to an unspecified destination at precise intervals. It may or may not continue moving from here – if it does, keep an eye on the cube moving times to confirm when it’s going next. The cube’s arrival latest part of the Fortnite Summer Skirmish series. It just so happens that Ninja was right around the location of the strike, and his Twitch offers a pretty good view of what happened from a player perspective. There are plenty more angles on the new addition (including one from FortniteBR on Twitter, which serves as our header image), but you can just hop into a game to see the cube for yourself. It’s tough to miss, so thank the bus driver and dive in to check it out.